Gilding Brushes are used for applying or cleaning up after Gilding when using Gold Leaf. Gold Leaf application of hand pounded thin sheets of precious Metals is called Gilding. When Gold Leaf Gilding, you'll find many different Gilding Brushes and tools for the various types of Gold Leaf. Gilders Tip's are used to pick up loose Gold to transfer the sheets of Gold Leaf. Gilders Water Mops are for applying Water Size (gelatin-water) to glass when making a true Gold Mirror finish, known as the fine art of Reverse Glass Gilding. Now weather you use Water-Size for a Mirror Gild or you're using the standard Oil-Size to Surface Gild (similar to varnish) to which give you a glowing satin finish you see on most Signs, Letters and Custom Pinstripe work, you'll need a Gilders Dusting Mop to gently Dust away the excess Gilding. Remember to dust gently, because the excess gold that you dusting off, can scratch the gold on the surface. 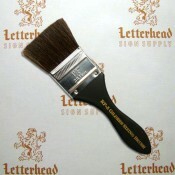 Speaking of scratching Gilding off, have you tried the Surplus Gold Leaf Removal Brush? Well after water/mirror Gold Leaf, we "Back-up" the areas we want to keep with Back-up paint. When the Back-up paint is dry, we use the Surplus Gold Leaf Removal Brush and a little Gilders Soap to remove the excess unwanted Gilding. You can learn more about Gilding in our how-to sections of the web site. 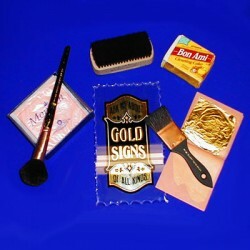 Along with the Gilding Brushes, we've include a few of the other commonly needed materials to Gild Gilding. Individual brushes listed BELOW! Brushes Box Case LargeBuy a Brushes Box Case Large for Sale here. The Brushes Box Case Large is made of Aluminum. Store your Lettering, Gilding or Pin..